Although several snow extent products are currently available (Grody and Basist, 1996; Carrol et al., 1999; Ramsay, 1998; Robinson et al., 1999) there is only one product that maps both dry and wet snow extent at near real time on a global, daily basis. 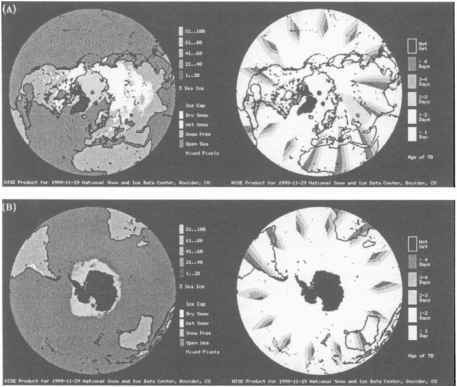 The Near real-time Ice and Snow Extent (NISE) product, produced by the University of Colorado's National Snow and Ice Data Center (NSIDC), is a daily, gridded map of sea ice concentrations and snow extent for both the Northern and Southern Hemispheres and is available from November 1997. The product currently uses passive microwave data from the SSM/I instrument on DMSP's F13 satellite. Vertically and horizontally polarized brightness temperatures from the F13 early morning (descending) orbits are used as input (early morning orbits are used to minimize the number of melting pixels). In addition to mapping sea ice concentration (0% - 100%), snow extent is mapped using a classification scheme that designates each land pixel as non-snow, dry snow or wet snow. Discrimination between dry and wet snow is a recent innovation and represents the first time that wet snow mapping is performed on an operational basis. The orbital data are gridded at 25 x 25 km resolution in an equal-area Lambert azimuthal grid. The day on which each grid cell is updated changes with latitude. High latitudes, with frequent overpasses, are updated daily while midlatitude regions are updated every 2-4 days. The number of days since a grid cell was last updated is provided as an additional data layer in the NISE product (see Figure 8). Dry snow is identified using brightness temperature data in the 19 GHz and 37 GHz channels including both vertical and horizontal polarizations (Goodison, 1989). 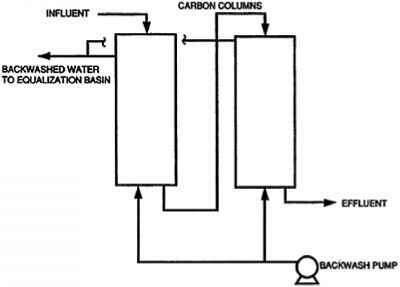 The algorithm was originally designed to map snow water equivalent (SWE). Here, any grid cell having a positive value of SWE is designated as dry snow. As discussed earlier, warm storms (clouds composed of liquid water droplets) can be mistaken for snow cover. These effects are partially removed by using a snow mask derived from 30 years of snow cover data from the NOAA weekly snow charts. Any grid location with a 1% chance of snow ever having occurred may be mapped as snow. Since snow in the mid-to-high latitudes is typically associated with ice clouds, warm storms are no considered a major problem. However, no definitive study has been performed and the frequency of these errors of commission remains an open question. When liquid water appears in the snowpack, vertical polarization brightness temperatures become much greater than horizontal polarization brightness temperatures. This polarization difference is the basis for the wet snow mapping algorithm developed by Walker and Goodison (1993). The NISE product includes a modification of this algorithm requiring wet snow pixels to be colder than 255 K in the 37 GHz channels, thus enabling the identification of melt onset. For modelers, information on melt onset can be useful for albedo parameterization and model validation. In the absence of ancillary information, albedo values can be assigned on the basis of wet and dry snow. In addition, more sophisticated parameterizations that include the number of days a grid cell has been mapped as wet snow (thereby further decreasing the albedo) are possible. The NISE product can also help validate modeled snow hydrology. Because its 25-km resolution is smaller than most model grid cells, NISE snow data can be used to compute fractional snow cover. The NISE product shows snow extent, identifies the onset of melt, and maps the regional ablation of snow. 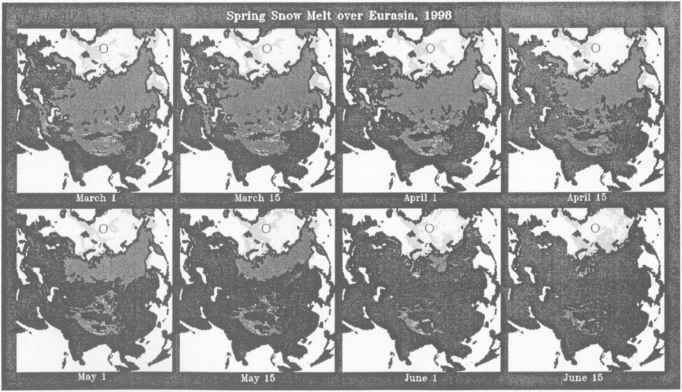 An example of this process is shown in Figure 9 where Eurasian snowcover is displayed at two-week intervals from March 1998 through June 1998. Snow cover on March 1st is extensive, covering the mountains of Europe, Scandinavia, the mountains of Turkey and Iran, the Himalayan plateau, and virtually all of northern Asia. As spring progresses, one can see the appearance of wet snow in various areas and its subsequent disappearance. In 1998, the proportion of wet snow in the Northern Hemisphere increases from about 1% in mid-winter to over 65% in early summer. Wet snow increases from about 3% in late March to over 20% in late April. During the spring season, the transition from an extensive cover of bright, dry snow to incomplete, lower albedo, wet snow can occur within a few days. With it's near-real time availability, 25-km spatial scale, and ability to identify melting snow, the NISE product is appropriate for mapping and characterizing snow extent and melt onset. Furthermore, the distinction between wet snow and dry snow provides some additional information helpful for characterizing snow albedo. Until a daily or weekly snow albedo product becomes available, a dry/wet snow indicator is a satisfactory substitute. Access to the NISE product is available through the NSIDC Data Catalog (http://www-nsidc.colorado.edu/NSidC/CATALOG/ENTRIES/nsi-0056.html). Improved passive microwave snow mapping products are planned to begin in 2001 following the launch of the Advanced Microwave Sounding Radiometer (AMSR-E) on NASA's Aqua satellite. AMSR-E has higher spectral and spatial resolution than SSM/I and will map snow covered area, snow water equivalent, and wet snow with improved accuracy and precision. In addition, snow surface temperature and the onset of melt over ice sheets will be mapped as a special product in the post-launch phase (Chang and Rango, 1997).